You may recall that way back in August/September—yes, I know, I can barely remember either!—I ran a “Fun With Thornspell” feature here on the blog. Here’s how it worked: over the course of several weeks I asked readers to tell me the Thornspell character they would most like to have a standalone short story written for, or about—as well as why, based on that character’s exploits in the Thornspell novel. And because I did not want to be the one to have to choose, I also asked three judges to decide which character, from among the suggestions you put forward, I would get to write a short story about—to be published here on the blog with a dedication to the selected commenter. Beth Miller: Beth Miller works at Writers House Literary Agency in New York, where she is the assistant to my agent, Robin Rue—and as such was amongst the first people ‘out there’ to read and love Thornspell. She is also a writer in her own right; her first novel, Into the Scottish Mist, was published by Wild Rose Press in 2010 and you can read my interview with her here. Peter Fitzpatrick (Fitz): Fitz was another early reader of Thornspell and has been an integral part of my writing journey since he has designed both my Helen Lowe and Thornspell websites, as well as designing the map for The Wall of Night series—for which he was nominated for a Sir Julius Vogel Award for Best Professional Artwork earlier in the year. Sharon Stogner: Sharon is an avid reader, follower of a number of blogs such as the Supernatural Underground, and a book blogger herself on the ismellsheep book and movie site. 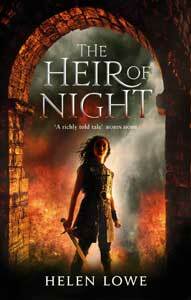 She was also an early enthusiast for both The Heir of Night and Thornspell. So: tomorrow. Right here. On the blog. And I hope you’ll enjoy! It’s a d***ed small world.. youi know Fitz.. I worked with him years ago at Canterbury Museum, and we share a hobby interest. ChCh certainly is a small town. The famed NZ “two degrees of separation”: but yes, I have known Fitz, initially through aikido, for many years—and of course he not only designed my websites but also the map for The Wall of Night world. Looking forward to reading Rue’s story! Andrew, I hope you will feel the long wait has been worthwhile. And now I can reply and say: it’s here! Thanks, Sharon—it’s been a while but I hope readers feel the result has been worth the wait. Another great read Helen! Spellbinding words again! Jenny, I am so glad you enjoyed, especially as I know that you really love Thornspell!